Last month my husband and I traveled with our daughter across the country for a wedding. Since we knew about the trip far in advance I had plenty of time to research/freak out about what it would be like to fly with a 14 month old child. Now, I'm sure there are those who would disagree, but I think that's probably the hardest age to travel with. These days Boo is eager to walk/run/tumble around so she's less satisfied staying put than a baby would be. But her attention span is probably about 3 minutes so she's not as easy to keep entertained as an older toddler would be. With these things in mind I began my quest to plan our trip. 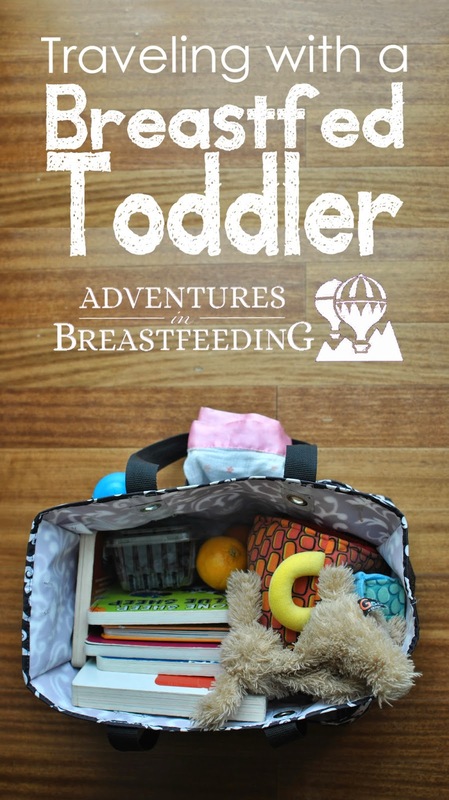 The strategies below are what worked for us on a plane, though I'm sure some of the ideas could be relevant for road trips, too, as well as for any toddler regardless of how they are fed. If you're planning to travel for the upcoming holiday weekend I'm hoping these tips help you out! Consider whether you need a passport for your tot. We decided to go ahead and get one rather than take her birth certificate with us. The best way to do this is to take terrible, out-of-focus pictures then wait until exactly the six week deadline to send them in. This way your anxiety will grow as you wait for the passport to arrive two days before you leave for the trip. Um...child, can you please sit still? Experts say the best time to get airline tickets is 6-7 weeks before your departure. I use Kayak to look for tickets and I like their graph thingy (that's the technical term for it) that advises you whether to buy or wait. Some parents have shared they prefer short layovers to long, but hear this: schlepping your early walker and all their stuff through the airport is no small thing. Better safe than sorry with layover time in my opinion. An hour or more is ideal. The next big decision is whether or not to purchase a seat for your bug or hold him in your lap. This was a no-brainer for us: there was absolutely no way Boo would sit in my lap for a 6 hour flight. She's not in love with her car seat, either, but when she was in it I could focus my energy on entertainment rather than restraining her from grabbing the passenger's hair in front of her. In terms of timing, there truly is no perfect time of day to drive an hour to the airport, spend an hour or more checking in and going through security, sit on the plane for x hours (for us it was two legs, 1.5 hours and 5.5 hours), then spend several more hours to disembark, get your crap, and find your way to your destination. 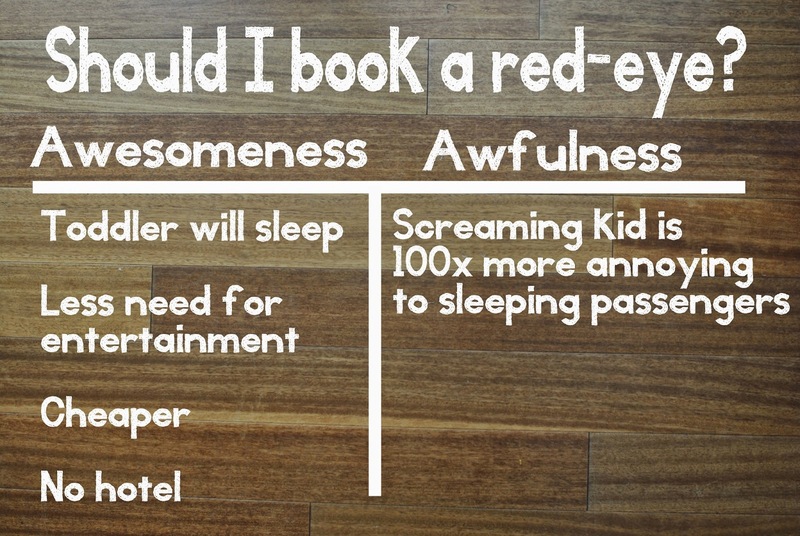 If you have a long leg like we did, you could consider taking a gamble and booking a red-eye. We were fortunate in that Boo slept for about half our red-eye, which meant we got to sleep, too (or at the very least simply sit instead of making funny faces, singing songs, reading books, etc.). In the end we were glad we did it even though it interrupted all of our sleep patterns. Not only was the flight cheaper, but it also gave us an extra day of vacation to see some fun sights in the city without needing to pay for another night in a hotel. Take heed: there were a few screaming kiddos on board so it is possible that your child will refuse to sleep and act like the world is coming to an end. Honestly it probably upset the parents more than those around them. Fortunately the engine noise dulled the sound of the cries. We also brought a tub of cheap earplugs to offer to those sitting in the rows around us (no adorable pinterest baggies here....we weren't aiming for cuteness, just for people to hate us less). bullet to keep Boo happy on our long flight. I found some helpful advice here and here. We ended up checking two bags (our pack and play was in one of them along with Boo's clothes and stuff) and carrying three on (though we condensed it to two on the way home). One carry-on had diapers, wipes, a change of shirt for me as well as a change of clothes for Boo, and miscellaneous other necessities. This carry-on was used more during the day so we stashed it overhead during the flight. I used a 31 tote bag for our other carry-on. I put it on the floor in front of Boo's seat and loved how easy it was to access stuff because of the open top. I also liked all the outer pockets for things like binkies, her sippy, lovey, etc. As I was pondering what to bring I contemplated Boo's obsessions. Things she truly loves. Number one: touching. 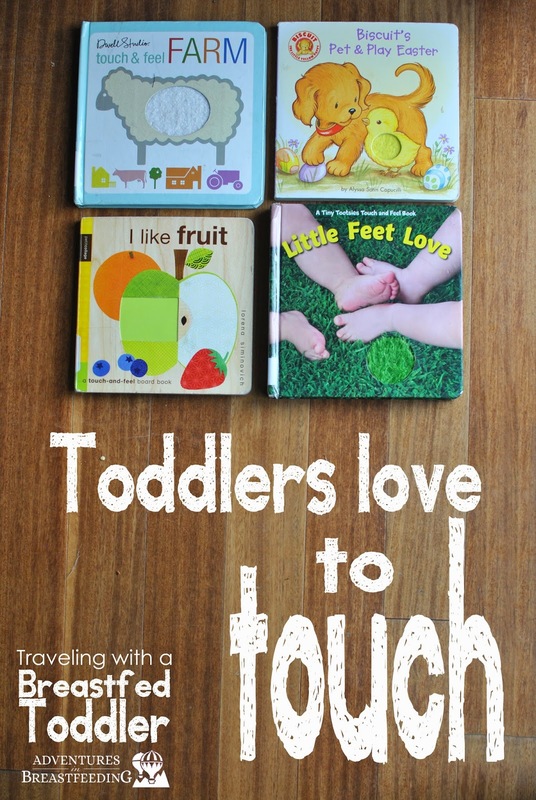 Touch and feel books are her jam. We raided the library for some new, never-before-seen-by-her titles and kept them top secret until plane time. Number two thing Boo loves: turning pages. On the flight she wanted to read these over and over again (which was fortunate since she only slept for 30 minutes the entire first travel day). 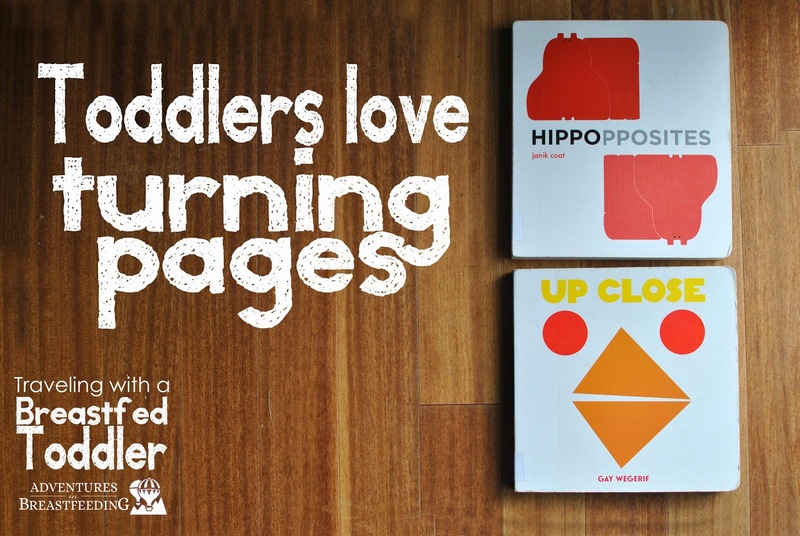 These titles have twice as many pages as most board books. One thing I didn't do that probably would have been a huge success was raid the dollar store for little knick-knacks like a spiky ball or other novel thingamabob. It's tough not to pack an entire arsenal of toys and necessities, but remember that you and your mate are the only ones who will be lugging all this stuff around (and retrieving it from beneath seats on the plane). Try to be choosy about the toys/books/snacks you take and know that last minute purchases in the airport or at your destination can help you out if you end up forgetting anything. I was intentional about my duds. I wore comfy jeans, comfy flats (oh my word they are my obsession), and layers comprised of a nursing tank, thinner tank on top, cardigan, and infinity scarf. That way I wouldn't have to suffer through feeling hot, but I could still feel covered when I was NIP. After checking our bags and heading to the gate, we let Boo race around like a banshee. She was very friendly and it gave us time to show passengers at our gate how adorable this little pumpkin was before she might blow out their eardrums on the plane. glad. It gave us plenty of room to secure her car seat in the plane and time to get situated. Plus she loved watching everyone board. It was worth losing the running around time in my opinion. I'd heard a lot about nursing during takeoff and landing to help with ears popping. However Boo never seemed bothered by that, plus she was too interested in everything going on outside the window anyway. Nursing did come in handy when she was over-stimulated in the airport and needed to wind down. Her favorite position is to sit upright on my knee and nurse like that. She loved playing with my scarf while she nursed and it was a helpful way to block out the world so she wasn't too distracted while she was breastfeeding. I had packed TSA's guidelines for traveling with an infant as well as our airline's breastfeeding policy because of recent BF mishaps in the news, but I didn't need them. From security to boarding to the flight itself, it was the best travel experience we've had. I guess having an adorable tiny person with you tends to charm everyone in your path. Well, that's it for my probably way-too-detailed account of our recent travel adventures. Just FYI, I wasn't paid to include any products in this post, though some of the links to the items I used are affiliate links. I hope the vacation you're planning goes as smoothly as ours did! It was definitely the most exhausting trip I've ever experienced, but it was immeasurably better than I anticipated. Are you and your child seasoned jet setters? What advice would you share with moms planning a trip for their family? Laura is a mom of two who is passionate about photography, teaching, and poverty alleviation. While she spends her days playing with her two girls she dreams up ways to foster genuine community in a culture rooted in rugged individualism. Her breastfeeding story involves an accidental affection for AP and a desire to cheer on other mamas in their breastfeeding journeys.